You can never go wrong with a captivating flower arrangement of luxurious pink roses, asiatic lilies and daisies. Steal the heart with the blissful collection of flowers. 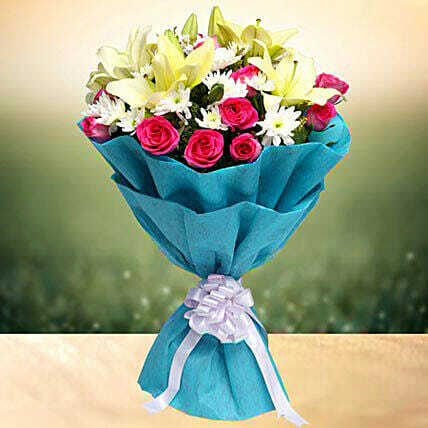 This elegant arrangement of premium flowers makes a truly luxurious gift. It sure is a visual delight. Perfect for any occasion- celebrate a birthday, anniversary, say 'thanks' or deliver a smile. ï¿½Love is knowing you are the bud from which his happiness blossoms.